Advanced materials are vital ingredients in products that we rely on like batteries, jet engine blades, 3-D-printed components in cars. Scientists and engineers use information about the structure and motion of atoms in these materials to design components that make these products more reliable, efficient and safe to use. Today, there are limits to how much scientists can see at atomic scales in these materials—especially while they are in use, and that makes it much harder to design new components that are exponentially better than what we have today. To provide the data necessary to improve these products, a team of engineers and scientists from the Department of Energy's Oak Ridge National Laboratory (ORNL) have developed a new pinhole-based diffraction technique they call PIND. In a paper published in Applied Physics Letters, they proved that it is possible to drastically improve the magnification and resolution of structures deep within engineered components with pinhole diffraction. "In a first for time-of-flight neutron diffraction on the VULCAN instrument, we were able to increase the resolution by roughly an order of magnitude with a pinhole," said Ke An, an ORNL instrument scientist. The concept is simple. Much as microscopes use lenses to focus light to magnify an object, a perfectly placed pinhole or slit can focus the neutrons scattering off a sample as they pass through. This small addition to the VULCAN instrument at ORNL's Spallation Neutron Source (SNS), coupled with the addition of a new and improved helium-3 detector, increased the instrument's spatial resolution by eight times: from 2,000 microns (µm), roughly the thickness of a spaghetti noodle, to approximately 250 µm, which is about the length of 30 blood cells in a straight line. "Not only have we proved that it is possible to drastically improve the resolution of neutron diffractometers with a pinhole, but we believe that it may be possible to further improve the resolution to around 100 µm with future detectors," said Alexandru D. Stoica, an ORNL instrument scientist. "Increases in resolution like this are exciting because they open up new possibilities for scientific studies of advanced materials." Unlike x-rays, neutrons are highly penetrating and nondestructive. This makes them an ideal probe for the study of 3-D-printed and advanced engineering materials, in real time under realistic operating conditions. VULCAN's ability to take advantage of these special properties makes it an excellent tool for studying changes in molecular structure; changes from one state to another, like from a solid to a liquid (a phase transformation); internal stresses caused when force is applied to an object; and texture in engineering materials. The ORNL research team used VULCAN to study the latter in low-carbon steel welded with a nickel metal filler. "With this new neutron diffraction technique, we were able to see the distribution of complete groups of crystals—all pointing in the same direction—in greater detail than ever before and without damaging them in the process," An said. "We were also able to see how the different crystal groups changed their orientation in real time when force was applied to the weld." The project was supported by ORNL's Laboratory Directed Research and Development (LDRD) grant. 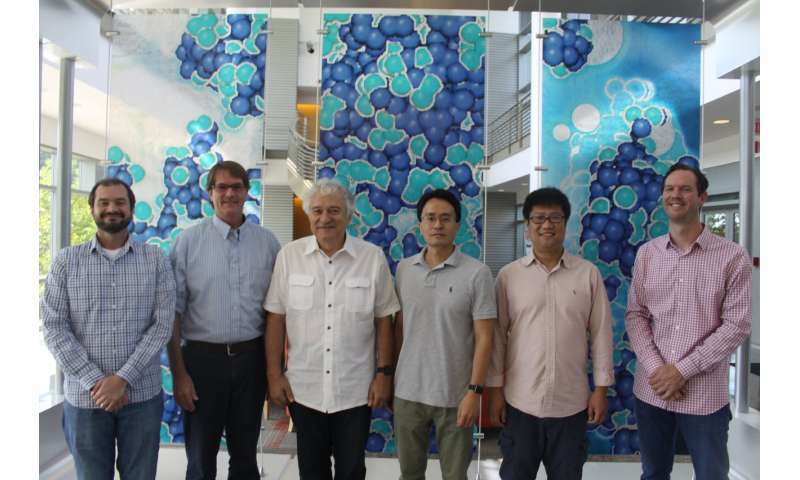 In addition to Stoica and An, ORNL's Wei Wu, Kevin Berry, Matthew Frost and Harley Skorpenske contributed to the project. "Moving forward, we are putting plans in place to replace all of VULCAN's detectors with the new and improved detector and to complete more research to see how much we can further improve the resolution on neutron diffractometers with the PIND technique," An said.